The Maserati GranTurismo is a perfect blend of luxurious Italian style and heart-stopping performance, making it the ultimate “driver’s car”. 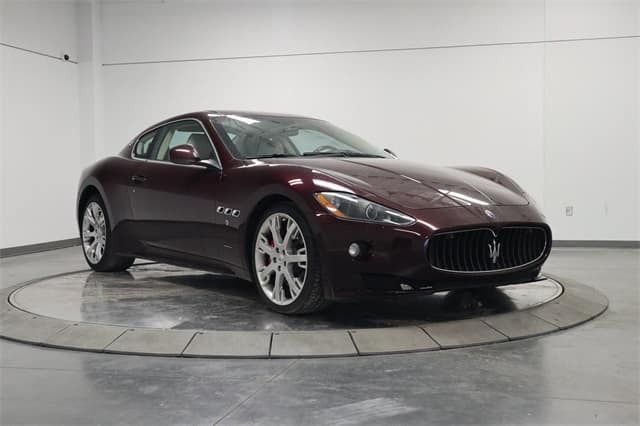 Mike Ward Maserati, conveniently located in Highlands Ranch, currently has a stunning pre-owned 2011 Maserati GranTurismo Coupe in our inventory. This beautiful Maserati has very low miles and is extremely clean. You are not going to want to miss out on the amazing acceleration and luxurious cabin of this beautiful car! Starting under the hood, this Pininfarina-styled automobile sports an engine that is a true powerhouse. Revving the 433-horsepower 4.7L SMPI DOHC V8 engine invokes pure excitement. Attached to the engine, Maserati has included an efficient 6-speed automatic transmission. Use each of the five capable transmission modes to find the setting that truly matches your driving style. All that power is delivered to sporty 20-inch Neptune alloy wheels, featuring low-profile performance tires. Being in the elegant, luxurious cabin is an incredible experience every time you sit in the plush heated seats. The 11-speaker BOSE audio system will totally immerse you in your favorite music. Voice-activated navigation is convenient and easily accessible to the driver using the Maserati Multimedia infotainment system. Genuine wood interior trim, auto-dimming/heated door mirrors, Bluetooth, driver seat memory, and a sporty leather steering wheel enhance the total driving experience. The design engineers at Maserati take safety very seriously. This clean used Maserati GranTurismo has safety features that are top-notch. Enjoy peace of mind with driver safety aids including rear parking sensors, Brake Assist, front fog lights, Brembo performance brakes, traction control, adaptive xenon headlights, and more! These amazing safety features give drivers inner calm that they deserve. Mike Ward Maserati near Denver has recently discounted this elegant 2011 Maserati GranTurismo Coupe over $5,000! Stop in for your exhilarating test drive today!